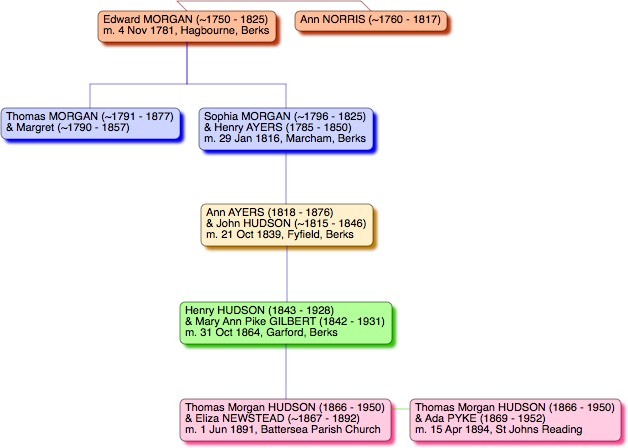 Thomas Morgan, the eldest son of Henry and Mary Ann Hudson was born in Garford and baptised there on 4th November 1866. In the 1881 census he was a grocer's assistant in Wantage. He seved n the Grenadier Guards 1883-1890. He Served in the Reading Police Force from 1890 until 1905. He lived for many years at 21 The Grove Reading. (Kellys Directory) and was a Commissionaire at Suttons Seeds after leaving the Police. Windsor 26 3 86 29 3 86 ? 3 ?